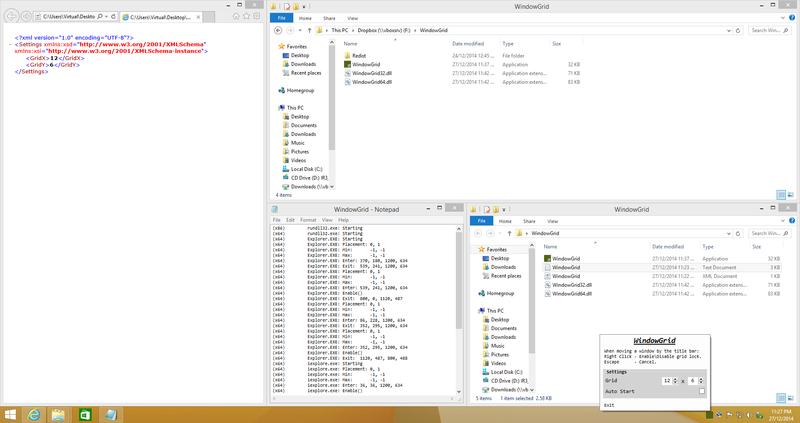 WindowGrid is a modern window management program for Windows. When moving a window by the title bar, simply right click to start sizing the window from the cursor. Move cursor to resize the window, and let go of left click when window is as desired. ADDED: Transposing of grid when displaying on a monitor in portrait orientation (Height > Width). MODIFIED: Re-added recommended OS settings. MODIFIED: Moved overlay code into WindowGridOverlay. FIXED: Should now work on pre-Windows 8 again. FIXED: Removed update connection warning on startup. UPDATED: Now using WPF in place of WinForms. FIXED: Install related issues on specific locales (Was related to directory security). FIXED: A few DPI related issues. FIXED: Hook related issues (i.e. Tab tearing in Chrome). ADDED: Spacebar as an alternative to right click. ADDED: Move window mode when pressing middle click. MODIFIED: Drastically simplified the hook process. FIXED: Auto start should now work correctly on Windows 7. FIXED: Small hook related problems. FIXED: Had issues updating from a path with spaces. ADDED: "Cover Window Overlay" option. MODIFIED: "WindowGrid.exe" will now use its running location as it's working directory rather than "ProgramData" (Portable). FIXED: Some hook related issues. ADDED: Option to disable splash screen. ADDED: Ability to change the grid colors from the context menu. ADDED: Option to enable showing of window contents while dragging windows. UPDATED: Compiled using VS2015 from VS2013. FIXED: Window borders in Windows 10 display correctly now. ADDED: Auto updating on startup. ADDED: Preliminary command line argument support. FIXED: Some scheduling related issues. NOTE: Some windows in Windows 10 may not display correctly. FIXED: Crash when using incorrect working directory. FIXED: Some performance and graphical issues related to the Grid. FIXED: Small hook related issue. MODIFIED: Unified the log files. FIXED: Visual Studio would crash when moving floating windows. FIXED: DLL now detaches from hooked process properly. FIXED: A single instance issue. ADDED: Install button in settings, installs the exe and adds shortcut to start menu. MODIFIED: Hook dlls now stored in internal zip file. 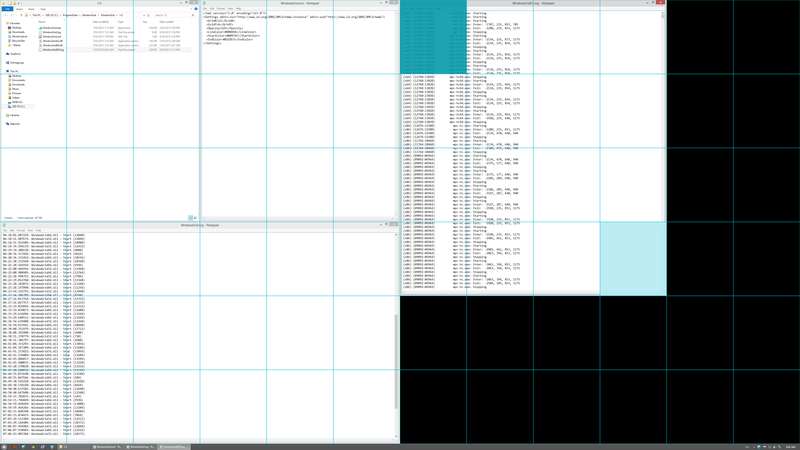 FIXED: WindowGrid wouldn't activate if dragged from a maximized window. ADDED: New logo and color theme. ADDED: Customizable colors and opacity in 'Settings.xml'. ADDED: Logger to the C# component. ADDED: Supported OS' to the manifest. UPDATED: Grid renderer (Better layout and new start/end point indicators). MODIFIED: Hold right click to select starting grid, let go to start sizing window. UPDATED: Visual Studio redists are now statically linked (Shouldn't be required). UPDATED: Now a single file, settings are now stored in user directory. ADDED: Disabling of Windows Aero Shake in settings.